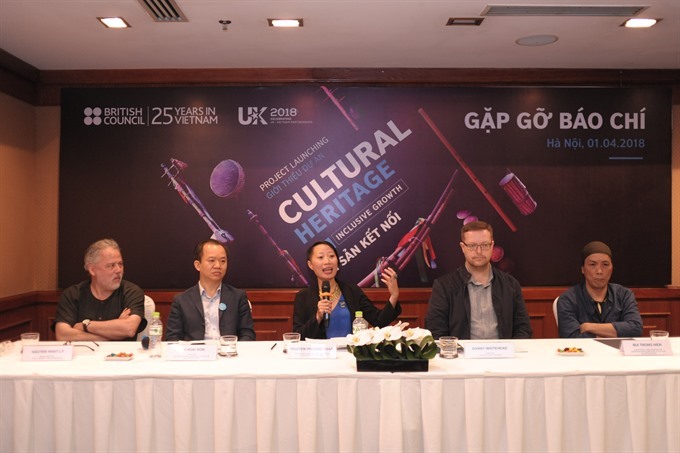 HÀ NỘI — The British Council (BC) in Việt Nam has launched a new project aimed at the preservation of Vietnamese cultural heritage, particularly in music and film. Entitled Di Sản Kết Nối or Heritage of the Future Past - a Cultural Heritage for Inclusive Growth, the US$700,000 project is being organised as part of the British Council’s culture and development initiative, with numerous activities planned over the next two years. The project will engage with the Vietnamese music and film industries, with particular emphasis on elements of those industries that are under threat of disappearing, or are generally under-represented in the modern media. The project coordinators will employ innovative approaches in working with music and film heritage to create inclusive and sustainable growth in the heritage sector. According to Nguyễn Phương Thảo – head of arts and creative industries of BC Vietnam – the project will work with a wide range of communities across the country to create new opportunities for them to contribute to, and benefit from, the protection, promotion, reinvigoration, and appreciation of their heritage. Ultimately, the project will promote a more dynamic understanding and enjoyment, as well as use of heritage assets in everyday life in the communities and in artistic, curatorial, and educational practices. The project will also engage with a dynamic list of partners, including cultural heritage agencies and institutions of the central and local government, and also with various arts and cultural organisations, and the private sector. Project activities will focus on research, documentation, conservation, training and capacity building (including oral teaching techniques) as well as innovation, advocacy and education (including policy and community dialogues), and the re-imagination and revitalisation of cultural heritage assets in contemporary practices. Being the principle cultural and educational organisation of the UK in Việt Nam, the British Council’s mission of improving cultural relations between Việt Nam and the UK takes paramount importance. The Heritage of Future Past project is a key aspect of this mission. The project is also part of a series of programmes and activities that the British Council will deliver in 2018, celebrating the 25th anniversary of its operations in Việt Nam. Whitehead said that since his first visit to Việt Nam in 1999, he has had many chances to see first hand the incredible music, the visual art, and literature of the country, and has been fortunate enough to meet many Vietnamese musicians, artists, poets and fashion designers. “It is the incredible cultural scene in Việt Nam that I think is one of the main things that make the country so special, and why people in the UK are so keen to learn more about Việt Nam,” he said.